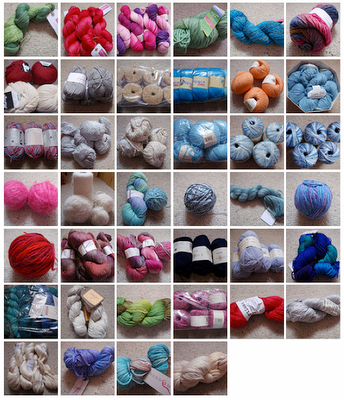 Inspired by a fellow Raveller, I devoted an hour today to photographing my stash. I'd love to pretend this is all of it. It probably represents about two thirds. Out of interest, I pulled my stash list off Rav into a spreadsheet and was mildly disturbed to discover that my yarn would now stretch for nearly 27 miles. A yarn marathon, indeed. e) 5 of them are leftovers from other projects, so .... not technically stash? I think that's a bit of a stretch. I am loving the winter Olympics, and particularly my knitting for the Ravelympics. The Shirley sweater is now going well, since I got the sleeve stitches on spare cables and joined the sweater in the round today. But, the yarn has dyed my hands blue and I am suffering a bit with claw hand, hence the blogging. I thought if I managed to finish the body of the sweater this weekend I might be OK, but I am not convinced I will manage it, what with The Claw and all. Really pleased with Amy Williams and her gold in the skeleton bobsleigh! I stayed up til 2am last night to watch her winning run. It's made all the better by the fact that she only lives in Bath so I might one day bump into her. Just like Jonny Depp and Nicholas Cage, two of the cities other famous residents. 1. Malaysia launch meeting - 43 sets of parents, I thank you. Whittling down the letters of application to a mere 16 is going to be a toughie this year. 2. Wispa Gold. I ate it after dinner last night....and tonight. The love affair continues, even though I feel like boycotting Cadbury since their latest piece of news. I am going to miss seeing that factory twinkling from the ring road when I drive home in the dark. 3. I was deliberately obtuse and bunked a lesson supervising my class in the hall and used it to plan my cover for the next two days. Nobody actually told me I was meant to be there so I used it to my advantage. I have teh guilt, because my friend Caroline is directing the production so it was her who was let down. She didn't seem to mind though, as she got new boots today. 4. I bought a ticket for the production on Tuesday and Caroline asked me to do front of house, so I feel like I am repaying her a bit. This year we're doing We Will Rock You. I love a bit of Queen. 5. 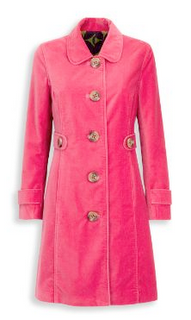 My new pink velvet coat shipped. Half price in the sale! Loves it. Yes, of course it's Boden. 6. I finished the first sleeve of the baby jumper, unpicked and 3NBO'd the shoulder I'd done wrong, seamed the sides and wove in all the ends. Now just one sleeve, seaming the sleeves in and the collar to go. I love fast baby projects. 7. I familiarised myself with the Shirley sweater pattern, ready for swatching. I really should be swatching now, rather than knitting this baby jumper, so I am all ready for casting on on Saturday: Ravelympics, day 1. But I have a lot of marking to do. Which is why I am blogging, and watching Die Hard. 8. I realised part of the Die Hard score is Winter Wonderland rescored to have a menacing, growly sound. I can't tell you how many times I have seen this film, and never noticed. 9. I watched The September Issue. Meh. I can't help but feel Anna Wintour was being disingenuous when she talked about her noble brothers and sister thinking what she did was a joke. Surely she's earning more than them combined, not to mention being easily the most influential of them all: the last laugh, I feel, lies at her door. And since she talked about fashion being a serious thing at the start, I don't think she can then expect us to feel sorry that her siblings might look down on her: surely that can't make her feel bad, if she believes her own spin? And, really, Grace Coddington could do with a conditioning treatment and a lesson in how to walk in flats, she looked like Stig of the Dump tramping through those halls. Good clothes, though. I loved that gigantic knitwear they were photographing for the texture piece. And I love Grace in general. Except I think she'd totally dismiss me for wearing so much Boden. 10. I enjoyed reading this article about the relative merits of Kits Kats and bananas. I liked the bit about the Dangers. I have been awol. I am not having a very good time of it at work. It's only little things but I am feeling all full of whinge and not in the mood for cheery posting, so I have thrown myself into my knitting and Facebook Scrabble by way of a distraction. I am knitting a garter stitch pullover (Rav link) for my friend Alison's baby, who is being christened in March but I can't go. And I am preparing for the Ravelympics. I want to knit a laceweight pulloever; my only concern is, I have 100% silk laceweight and mostly this is only used for shawls, from what I can find on Ravelry. So I am going to swatch for the Shirley sweater ('nother Rav link) and see how it goes. It's a Kidsilk Haze pattern, but I am hoping it will work out, even if I have to knit it a size down to keep it clingy. I REALLY hope it works out, the yarn is absolutely stunning! It is by Knitwitches and is the most amazing shade of blue, called Lapis Nights. Yes, blue, of course! But deep blues like this aren't too common. I will photograph it if I am ever at home in daylight again. I am in danger of developing a serious Knitwitches habit since discovering them at FibreFest in August. Then, I bought 3 skeins of undyed pure silk and a skein of luscious grey cashmere (which, actually, I had forgotten about blush) and now that I am more amenable to laceweight it's like a whole new yarn wilderness stretching out ahead of me. Heaven forbid, I find I love knitting socks....I think I would have to buy a new house. I am thinking of setting myself a knitting goal for this year of a sweater a month. This is mainly because I urgently need to see to my stash, as well as knit some things from my queue. So I was thinking - a top a month (not necessarily with sleeves) and an extra, like the baby jumper this month. I don't think it is unachievable. We'll see how it goes. Meanwhile, ROLL ON HALF TERM. Still no sign of Ofsted but honestly, I don't think their visit could be worse than the endless build up to it. I shouted at a member of the leadership team in the staffroom this week, and I'm normally Little Miss Sunshine. It's not a great time. But, yey, I am out Wednesday at a meeting and Thursday visiting the college in Oxford that will be hosting our conference this year (HOOGE feather in my cap) so it's only really two more days til break, and then I am off to Warrington and then Sheffield so I can just forget everything for a bit....and knit Shirley. I booked train tickets so I have lots of free time!